Does the snow have you ready to run away to somewhere warm? Are you dreaming of beaches, warm weather, and maybe Cardinals frolicking under palm trees? Missing baseball so much it hurts worse than the icy wind blowing in your face? 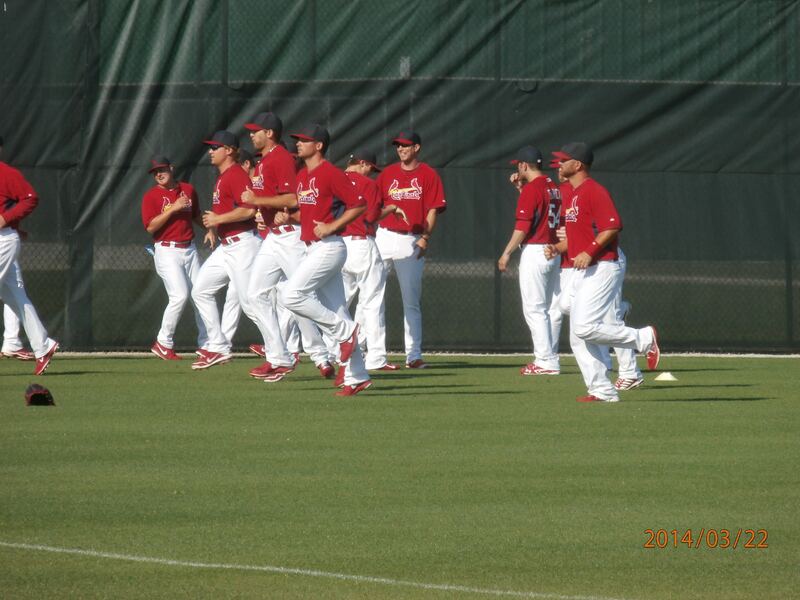 Wishing you could teleport yourself into those pictures coming out of Cardinals Camp? Thinking about actually joining them? You’re not alone! As winter weather statements and advisories blow up my phone, I take solace in the fact that in about 4 weeks, I’ll make my 6th annual to pilgrimage to Jupiter, Florida and St. Louis Cardinals Spring Training. Mixed in with those incoming winter weather alerts have been messages from friends and acquaintances asking for information on to make the most of spring training. Just thinking about the answers warmed me and made me forget about the frosty forecast. I’m not an expert on this, but I have picked up some useful information over the years. Tips on where to stay; how to navigate practices; purchase tickets to games; grab autographs; where to eat; and killing time when not watching baseball or laying on the beach. While I’m not a travel agent, I do stay at a Holiday Inn Express. 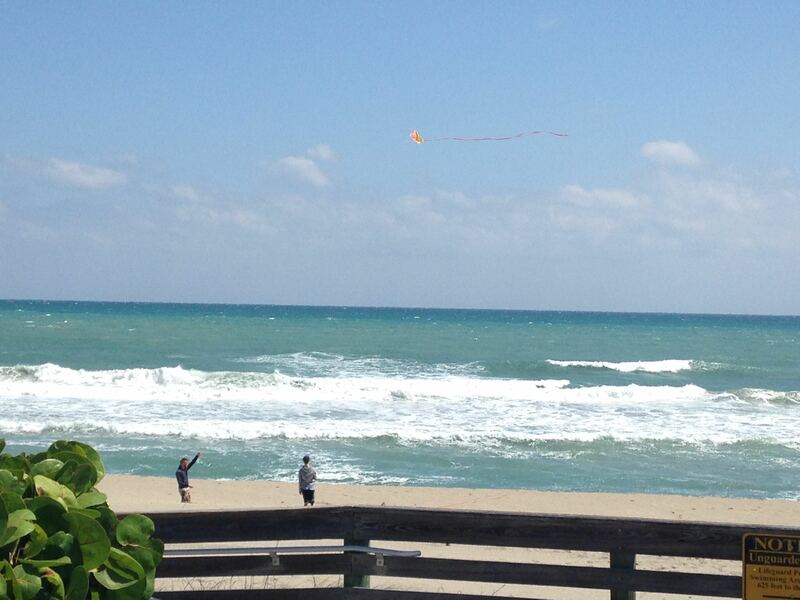 The Holiday Inn Express Juno Beach has been my spring training home every year. It is billed as “Oceanview”, but only a few rooms have that view and even from those, the view is limited. Personally, it’s not a big deal, there are rooms that overlook the pool if you must have water out your window. The Holiday Inn Express is a half block from the beach, so it is very close. Guests can grab a loaner beach chair from the front desk at no charge. If I’m not watching baseball, I’m on the beach. My friends have stayed at the Hampton Inn across the street from the Holiday Inn Express, and enjoyed it. Both hotels have breakfast included in the room rate and are about a 10-15 minute drive to Roger Dean Stadium and Cardinals baseball. Let’s get to the real reason we find ourselves in South Florida in February/March: Baseball! 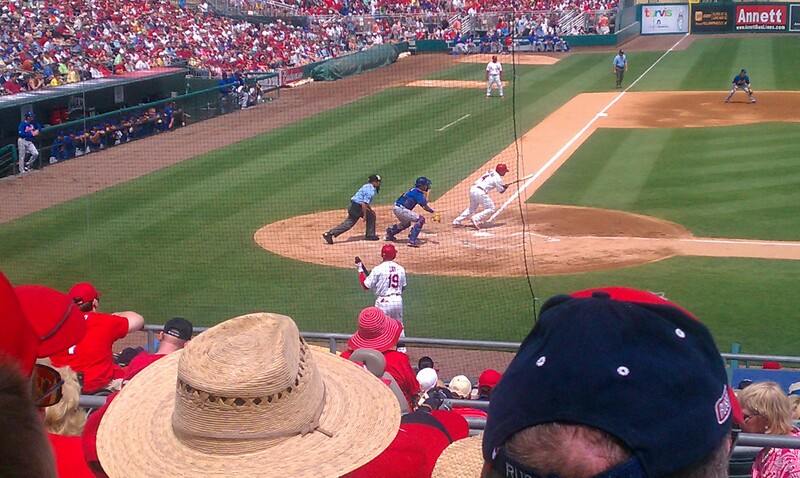 St. Louis Cardinals Baseball! 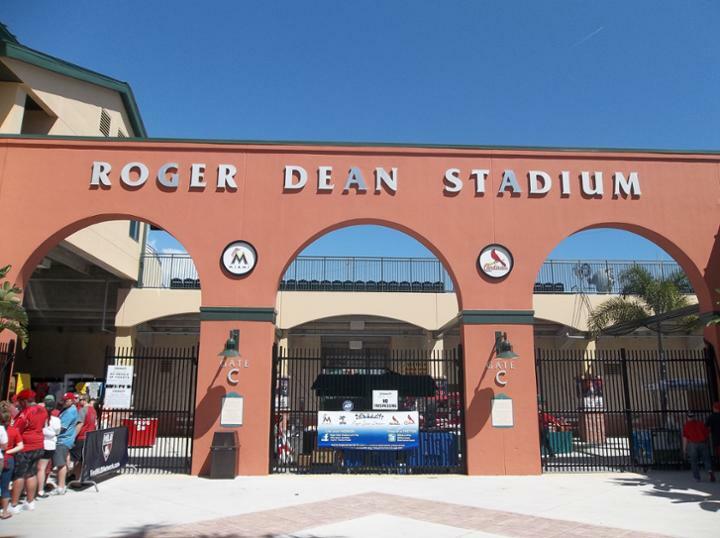 Roger Dean Stadium is located in an area called Abacoa. In addition to the baseball stadium and practice fields, Abacoa is home to restaurants, businesses and a large residential area. Street parking is available, but at a premium and there are restrictions (2 hour limit, etc), so watch for signs. There are also 2 parking garages fairly close to the Roger Dean complex. The big leaguers practice on fields 1 & 6, behind the actual stadium. The players usually come out to the fields about 9:45 and practice until about 11:15/11:30. For a run down of practice, check with the security guys at the gate to the players parking lot (which is between the stadium and the practice fields). They usually have a sheet that shows the practice schedule for the day and which players will be where & when. Fields 1 and 6 are adjacent, so you can watch both fields without much walking. (Although, there is quite a bit of walking from the parking to the stadium/fields, so be prepared). There are bleachers available, but know that many people will be lined up along the fence to watch practice, so your view might be slightly blocked. Arriving around 9:00am will more than likely get you a spot along the fence, but know that you will be standing for a couple of hours and leaving your fence spot will probably result in forfeiture of said spot. Sometimes, after practice, a player or coach will come to the fence line and sign autographs. Hence, the high demand for that fence spot. Once practice is over, if there is a Grapefruit League game, many in the practice crowd file into Roger Dean Stadium. I recommend purchasing tickets ahead of your trip. Unless you buy “season tickets” or a 6 game ticket plan, your best bet is to call the ticket office, as only full season and 6 game ticket plans can be ordered online. As with the regular season, there is a dynamic ticket price scale, based on opponent. The sooner you order your tickets, the better your chance of sitting in the seat of your choice. The ticket windows are open for walk up sales, but some games do sell out. There are also “Grass Berm” tickets, sold the day of the game. These tickets give you access to a grassy area in right field. There are no actual seats and lawn chairs are not permitted. Blanket seating only. If, after the big league practice, you don’t have tickets or the team is playing an away game (there is usually still practice on those days, but it may be shorter and/or more informal for the guys not on the road trip), you can wander to the minor league fields. They are located farther back, behind the fields where the big leaguers practice. The Kissell Quad is the hub of the fields where the minor leaguers build their skills. You will see lots of coaching and skill drills. You won’t have to fight for a prime viewing spot. Most of the sparse group of observers are parents or friends of players. It seems the demand for autographs is never-ending. Sports memorabilia is big business and nowhere is that more obvious than throughout spring training. Professional autograph hounds and their hired teens stalk stake out these same spots. That said, the players do sign, but it is a crapshoot. There are a few places where the odds may be in your favor. As mentioned, sometimes players sign after practice along the fence. Another place where you are more likely to grab a signature is at the gate to the player’s parking lot. There will be a line on the sidewalk and IF a player (players) sign, security will do their best for everyone in the line to get up to the vehicle safely and get an autograph. If you attend a game, standing along the first base line or near the dugout are prime spots to get players’ attention and a signature. This is true before and after a game. Good luck! Once you have maxed out on baseball for the day, you might be ready for food. Right across the street from Roger Dean sits JJ Muggs Stadium Grill. This sports bar & grill serves up traditional fare and is a great spot to grab a bite before or after the game. Much like a majority of Florida establishments, there is plenty of patio seating. Also within the Abacoa area is Jumby Bay Island Grill. As the name suggests, it has a laid back, fun vibe. While there is plenty of wonderful seafood here, the menu does include other fabulous items, such as pasta, chicken, ribs, and steak. 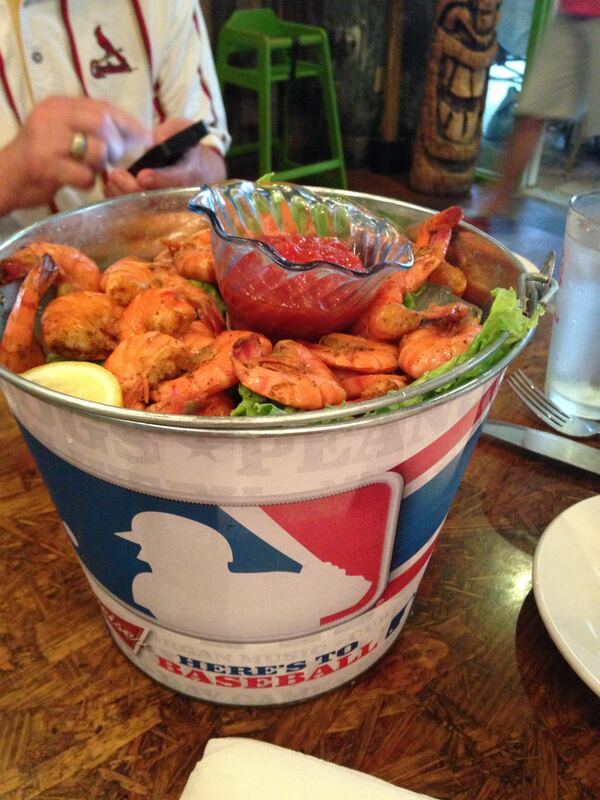 A bucket of peel & eat shrimp? Yes, please! Back near the Holiday Inn Express, there are quite a few restaurants. My two favorites are the Thirsty Turtle and the Juno Beach Fish House. The Thirsty Turtle Seagrill is a sports bar with a seafood twist (and right across the street from the hotel). I could live on the grouper sandwich, except I’d miss the grilled tuna sandwich. “The Turtle”, as we affectionately call it, is our “Cheers”. We’ve been known to visit more than once during our stay. The beer is cold (and fairly cheap), the food is great and the servers and atmosphere are phenomenal. The owners are from New York, so the sports memorabilia is heavily New York themed, but they don’t seem to mind the invasion of Cardinals fans. The Fish House is right next door to the Holiday Inn Express and shares part of the parking lot. As the name implies, the feature is seafood, but there are other options. The nice thing about the Fish House (in addition to the location) is their “Sunset Menu”. Yes, it’s Florida and yes it’s an “early bird dining special”. No. I’m not 80, I can just appreciate a quality meal at a discounted price. If you order by 6:00 pm, you get salad, an entrée with two sides, a non-alcoholic beverage and dessert for $17.99. The Key Lime Pie is heavenly. 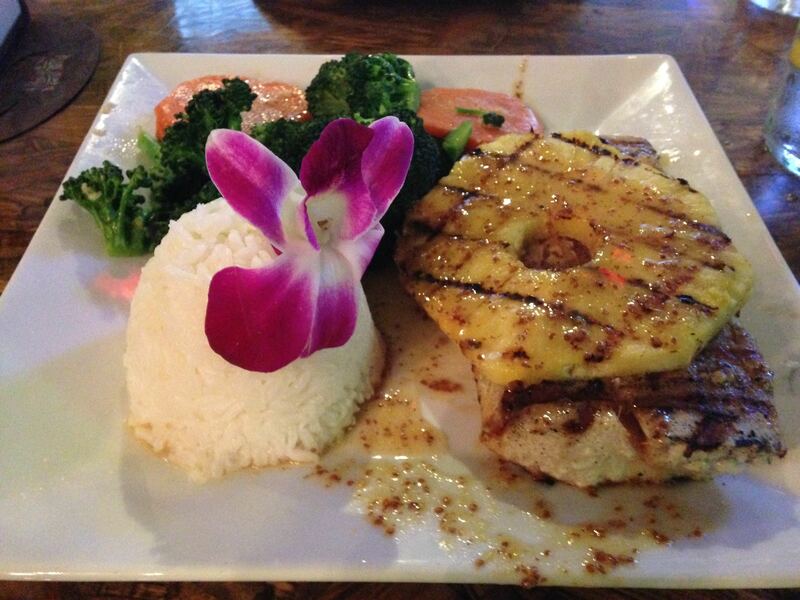 For a little more upscale dinner, Jetty’s is the place to be. They do not take reservations, so get there early to avoid the longest of waits. However when asked “inside or out?”, go with the outside seating. You will wait a little longer, but you will be rewarded with a view of the Jupiter Inlet Lighthouse. It’s gorgeous (and there are outdoor heaters if it happens to be chilly). Jetty’s menu is heavily seafood, but also features steak for the non-fish eaters. My favorite is the Chilean Sea Bass, but honestly, no one I’ve dined with has had a bad or even unsatisfactory meal there. Also, Jetty’s is a favorite of many of the Cardinals players & coaches, so you never know who you’ll “have dinner with”! There might come a day during your trip where you need or want a baseball break. 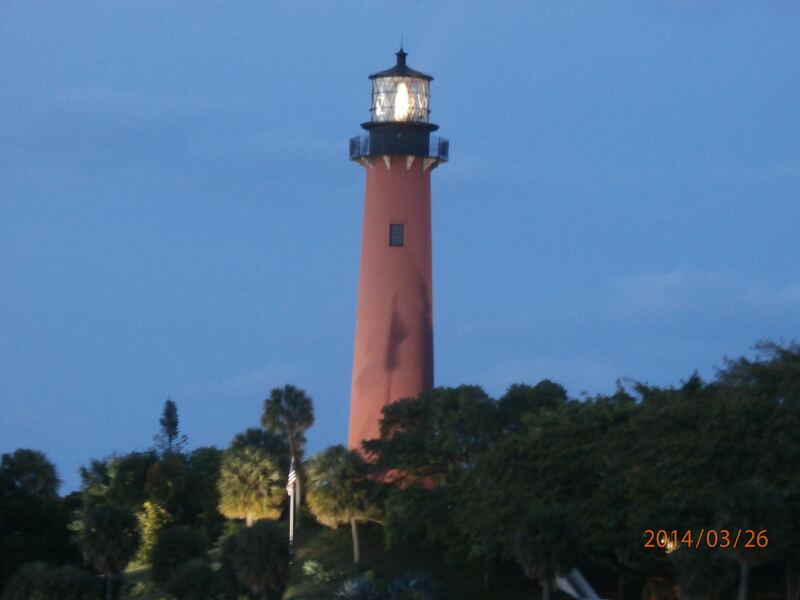 The Jupiter Inlet Lighthouse & Museum offers tours daily from 10:00 am-5:00 pm (Last tour leaves at 4:00). Tours cost $9 for adults and $5 for children 6-18. Children under 5 are free. If you aren’t afraid of heights or small spaces (and are at least 48 inches tall) you can climb to the top of the lighthouse. The view is spectacular! If you’d like something a little more low-key, try a visit to Loggerhead Marinelife Center. The center houses an informational exhibit hall and gift shop, in addition to being a functional turtle hospital and rehabilitation facility. Yes, outside the center, there are tanks housing different types of sea turtles. On each tank, you will find the turtle’s name and information on where the turtle was found and what it is being treated for. Staff members/volunteers mingle about and answer questions about the turtles and provide further information. 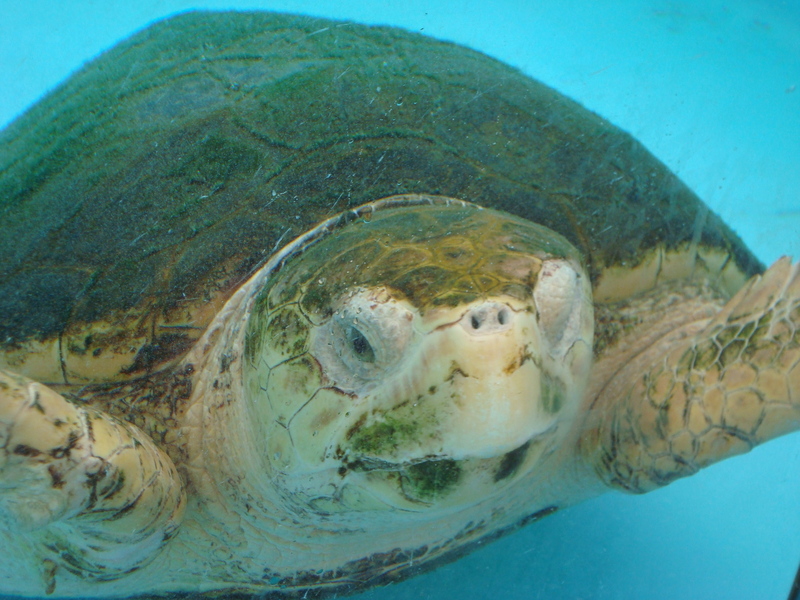 The Loggerhead Marinelife Center is open from 10-5 Monday through Saturday, 11-5 on Sundays. This is not an all-inclusive list. In fact, I’m sure I’ve missed something. If you have been to Jupiter/Spring Training and feel I’ve left out anything, please include it in a comment! Have more questions? Leave them in a comment. I’ll be happy to help, if I can! Are you ready to go? I am! This entry was posted in 2015 Cardinals and tagged Jupiter, Roger Dean Stadium, Spring training by Stacy Brixey. Bookmark the permalink.